In this post you will see how powerful powershell is in combination with external applications like SCHTASKS.exe. /S $_.Name /SC DAILY /TN "Task_Name"
This entry was posted in Powershell and tagged One-Liner, Powershell, SCHTASKS on August 25, 2009 by afokkema. Last week I posted a script to add Notes to a VM. After posting this script there was a little discussion on Twitter with @vmdoug, @gabvirtualworld if the Notes field is the right field to add this kind of information. So @vmdoug introduced me to the world of Custom Fields. So I changed my CSV file and added the Field entry. This Field entry will be de name of your custom field. In my case I called it Description. This entry was posted in VMware and tagged PowerCLI, Powershell, vm on August 17, 2009 by afokkema. My colleague asked me to add some notes to the VM’s so he knows what this VM is doing. So this is a nice job for PowerCLI 🙂 . In this post you will see how powerful PowerCLI /Powershell is. With only one line of code (one-liner), you are able to achieve this job. Note: This script will overwrite the existing Notes, so use it at your own risk! This entry was posted in VMware and tagged PowerCLI, Powershell, vm on August 14, 2009 by afokkema. Click on the picture below to get your copy of this e-book. This entry was posted in E-Book and tagged Powershell on July 14, 2009 by afokkema. If you want to use Microsoft Excel in your Powershell scripts. The work around for this issue was changing the Regional Options back to United States International. guillermooo has created a port to Powershell. Just copy the following code and you should be able to open Excel and create a new workbook. $ci = new-object system.globalization.cultureinfo "en-US"
$e = New-Object -COM "Excel.Application"
This entry was posted in Microsoft and tagged Excel, Powershell on July 2, 2009 by afokkema. The following script is part of another script but I wanted to show you some nice Powershell stuff in combination with Microsoft Excel. This script will generate an Excel sheet with some VM information. It will color the cell red if the Powerstate equals to NotRunning. $vCenter = Read-Host "Enter your vCenter servername"
This entry was posted in VMware and tagged Excel, PowerCLI, Powershell on July 1, 2009 by afokkema. VMware is the king when it comes to virtualization. Windows PowerShell has gotten huge accolades as an extremely powerful tool for automation of IT tasks. 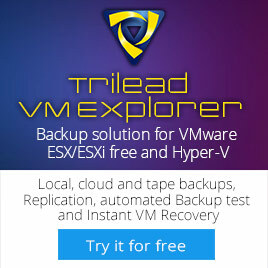 These two technologies make a lot of sense together, and VMware is now making that happen with the release of their VI Toolkit for Windows. In "Managing VMware Infrastructure with PowerShell", you will learn how to perform everything from simple ad-hoc reporting at the command-line ("are any of my virtual machines powered off?") 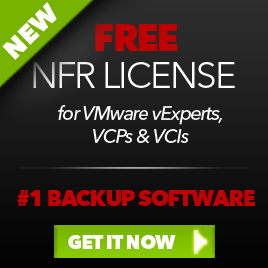 to complex scripts to automate a massive deployment of hundreds of virtual machines. Simple, yet powerful; concise, yet robust; you will enjoy using this new language to solve your old problems using less code than you thought possible. If you are a system administrator responsible for managing a VMware Virtual Infrastructure (version 2.0 or above), or a standalone ESX Server (version 3.0 or above), then you need this book. 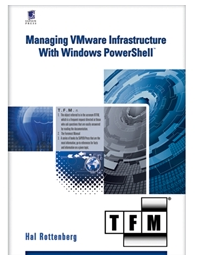 Aimed at scripters of every level, the book starts off with a PowerShell primer and continues well into the internals of virtualization on the VMware platform. This entry was posted in Book and tagged Powershell, VMware on April 3, 2009 by afokkema.